That question or some variation of that question comes up quite a bit so I thought this would be a great place to have it out. 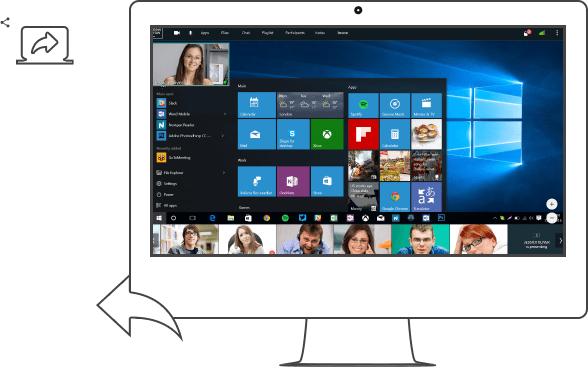 Desktop share — or screen share —software enables you to broadcast your computer screen to remote viewers wherever they are in real-time. When you are sharing your desktop in a live class, your learners are able to follow along as you work with complex software or present animated presentations. This creates a dynamic, immersive learning experience. I use the newrow_ desktop share app when I am instructing remote learners on how to use various applications either on my computer or on the web. They are able to see my cursor in real-time as I navigate those applications and explain what I am doing. Whether you are running training & development workshops, customer support or teaching courses on mastering Microsoft Excel, desktop share is a must have in your quiver of tools for online instruction. What about upload and share? 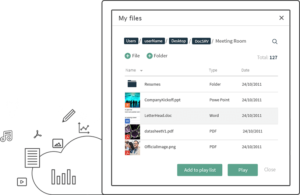 I detailed Newrow’s cloud storage and file management system in another post that you can checkout here. In short, you are able to upload and store nearly any file format in your newrow_ account with newrow_ secure cloud storage. This is great when you need to access important collateral from anywhere. You don’t have to worry about using the same computer when teaching your class because all of your course files are easily accessible in your account. There are certain uses of desktop share that cannot be achieved with uploading and sharing a file such as live tutorials of rich applications like Photoshop. The question then is why use desktop share to share supported file types that can be uploaded and shared in a live class. Animated presentations — When you upload your presentation to newrow_ smart we store the original file, but we also convert the file to a format that enables us to display the file in the room and utilize collaborative annotations. At this time the conversion is similar to saving your presentation as a PDF. The animations are “ignored”. If you want to share a presentation with animations in a live class, then you should use the desktop share app. Live editing — When you are sharing a presentation or spreadsheet via desktop share, you can make changes to the files based on feedback you receive during the live workshop. Using desktop share here gives that working in the same room feel. Large file + no time — With the newrow_ file management system and playlist, we encourage instructors to upload their content ahead of time to help them organize their course. However, sometimes you need to share a file that you haven’t yet uploaded. If you need to share a large file such as a graphic-laden presentation, then you may not want to interrupt the flow of the class to find the file and upload it. You can just use desktop share to keep the class going without interruption. The newrow_ desktop share app is a Google Chrome extension. In order to share your screen, you will need to use Google Chrome and “install” the newrow_ extension. I added some support links below. Utilizing the newrow_ file management system is a great way to organize your course content and ensure that you always have access to the files you need. You can then utilize the newrow_ playlist to organize your course content as you would slides in a presentation. That being said, desktop share has it’s place not only for software tutorials, but also to highlight the rich animations of the presentations you prepare.